With continued discoveries and innovations, the field of materials synthesis and processing remains as it has been for many decades, a vibrant and fertile area for research and development. It comes, therefore, as no surprise that every Pac Rim conference has had considerable emphasis on this topic with many symposia devoted to various aspects of this field. 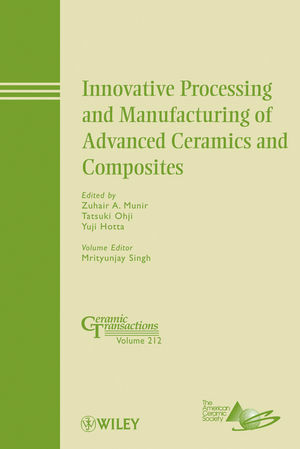 This Ceramic Transactions volume represents selected papers based on presentations in four symposia during the 8th Pacific Rim Conference on Ceramic and Glass Technology, held in Vancouver, British Columbia, May 31-June 5, 2009. Zuhair A. Munir is a Distinguished Professor of Materials Science at the University of California, Davis. He received his B.S., M.S., and PhD from the University of California, Berkeley. He has served as Associate Dean and as Dean of the College of Engineering. Professor Munir has been the recipient of numerous awards and honors, including the John Jeppson Award from the American Ceramic Society, The Faculty Research Award and Medal form UC Davis, the Medal of Honor form the International Organization of SHS, the Creativity in Research Award from the National Science Foundation, and the von Humboldt Award from Germany. He is listed as a Highly Cited Author in Materials Science by the Institute for Scientific Information. Professor Munir is a Fellow of the American Ceramic Society and the American Society for Metals. He is currently an Editor for the Journal of Materials Science and an Associate Editor for the Journal of the American Ceramic Society and has served as Editor-in-chief for the Journal of Materials Synthesis and Processing and as a Principal Editor for the Journal of Materials Research. Professor Munir is the author of more than 400 papers and 12 patents.